The leadership team is charged with creating the vision and the plan for math pathways. The team is chaired by the math department chair or designee and should include representatives from a number of stakeholder groups (see the DCMP Implementation Guideview full resourceDownloadFile for more information). During the Planning stage, the leadership team meets regularly, at least once a month. The institution provides logistical support to schedule and hold meetings, collect data, and disseminate information. The leadership team chair reports to the administrator with authority (e.g., chief academic officer) over the work at least quarterly and the president receives updates at least twice a year. Russell Self from Trinity Valley Community College describes how his students grew in a course aligned with the DCMP Model become independent learners. The Planning stage is critical and has a number of pitfalls. 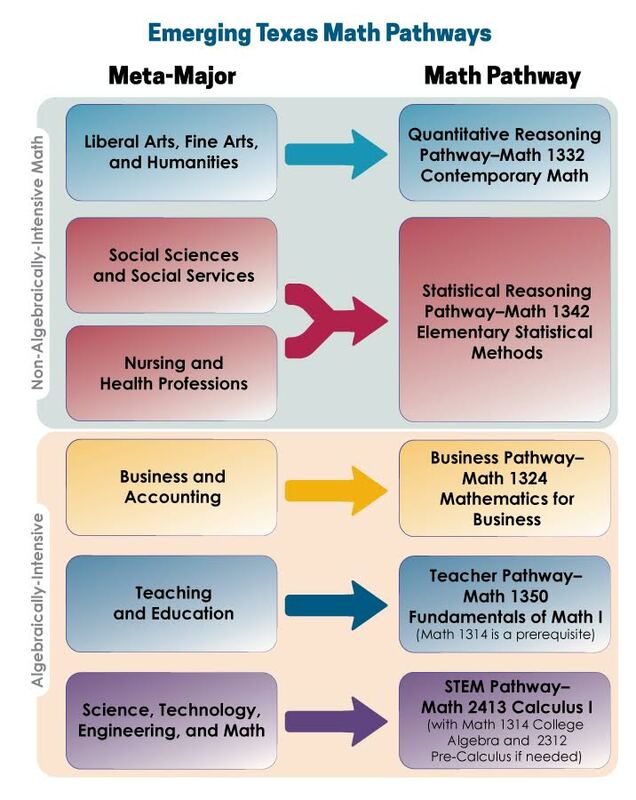 One of the most common is failing to begin the process early to align the math pathways to programs of study. Because this is such a major challenge, the Dana Center provides a detailed guide to support the process. Another pitfall is jumping ahead of the early steps of planning. As noted above, steps in this process may overlap, but we strongly recommend taking the time to review the institution's current context, define problems, and set overall goals before committing to specific strategies. This process serves several purposes. It helps identify and honor previous work that can lay the foundation for improvement. It develops a shared understanding across the different stakeholder groups and builds ownership. It also surfaces hidden problems and helps the team ensure that the selected strategies will address the problems and help achieve the goals. Finally, many institutions make the assumption that the pathways can only be implemented gradually over time. While sometimes this may be the case, we encourage institutions to consider if they can implement at full scale quickly. Often it is easier and more effective to implement a new approach fully across the system than to try to maintain dual systems over a transition period. The leadership team chair disseminates one or two key informational resources for the team to discuss in order to build a common understanding of math pathways. The leadership team gathers and reviews information on the current context to build a common understanding of the problem and the drivers that contribute to that problem. The leadership team defines what math pathways are needed at its institution. If there is a statewide or regional effort to establish pathways, it is likely the pathways will be defined through that process. The leadership team sets goals for implementation. The leadership team reviews options and identifies strategies. The leadership team creates an implementation plan that includes strategies for communication and engagement. View our video resource, " Telling Your Math Pathways Storyview full resourceDownloadVideo," along with the accompanying handoutview full resourceDownloadFileVideo.